Sun bicycle have been building quality adult tricycles for over forty years and has become the largest seller of adult tricycles in the world. I personally know Jack and Ben, the owners at Sun Bicycles, and there are no harder working guys in the bike business. Sun Bicycle’s philosophy has always been to offer good quality products at a low price and then stand behind the product. Sun Bicycle has just recently upgraded there industrial tricycle and changed the name from the Atlas Deluxe to the Atlas Transit. Frame: The frame on the Sun Atlus Transit is MIG welded together in Taiwan and has a 250 Lbs. capacity. The frame is easily put together by bolting the rear section to the front by using four bolts. 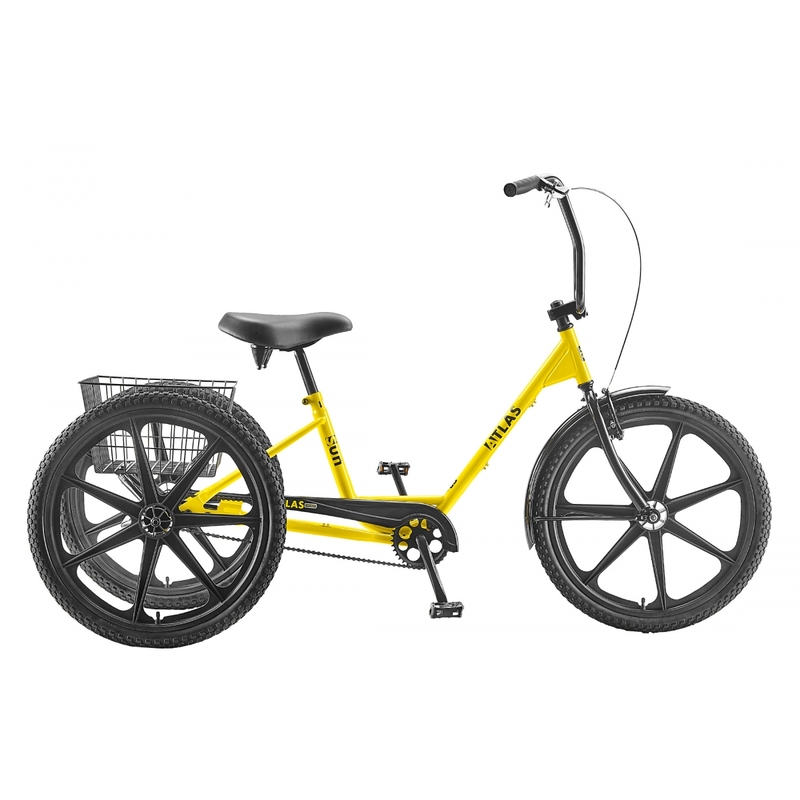 Sun offers the trike in two colors, Yellow and Black. Gearing: The stock set up of the Sun Atlus Transit is a one speed freewheel. Most factory and industrial users will add the coaster brake kit to the trike so the trike can be stopped by pedaling a quarter turn backwards with the pedals. Sun also offers a three speed and five speed coaster brake kit which is a nice addition if you have to ride up a ramp or hill. Braking: The Sun Atlus Transit uses a “V” style front brake which is welded to the fork of the trike. The “V” brake come with oversize brake pads and can stop the trike more than sufficiently. The braking will very depending on which wheel set you choose. The best stopping can be achieved on the aluminum rim followed by the steel rim and then the mag wheels. Seat: Big, oversize and with springs, all of our trike tester feel the stock seat is of good quality and more than comfortable enough. Ride: We like the ride on the Sun trikes. The cranks are positioned a bit farther forward which gives the Atlas Transit a more recreational feel and adds stability. While moving the cranks farther forward helps stability it also makes riding the trike standing a bit more awkward. The Atlas Transit handing is precise and predictable and all of our testers thought Sun has offered up a good designed product. Wheels: Sun offers lot of wheel choices for the Atlas Transit. The stock set up is with Mag Wheel, you can also get aluminum wheels which come with aluminum hubs and stainless steel spokes or steel rims with heavy duty spokes. The mag wheels are molded from a plastic like material which will not rust and should not get out of true. A popular option is tire liner to help prevent flat tires or solid tires. Other Stuff: Large rear basket, front fender and reflector set are included. Sun also paint the handlebars, cranks and other parts to make the trike very corrosion resistant. Pros: The Atlas Transit brings safety, durability and stability to everyone who rides this well built trike. Features sealed crank, headset and rear axle bearings, extra wide saddle with springs, heavy duty rear basket and three different types of wheel to choose from. The frame is Mig welded together and the construction is solid. The trike is very corrosion resistant; paint is applied evenly and consistently to not only the frame but the other parts as well. Industrial Bicycles, Buy Now! Adult Tricycle Reviews, Buy Now!